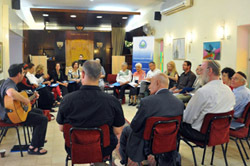 Jerusalem, Israel - A conference brought together people of diverse religions and nations to discuss the highly sensitive issue of the status of the holy sites in Jerusalem. 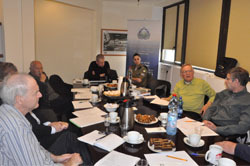 Statement by participants in UPF's interfaith and interdisciplinary consultation on “Jerusalem and the Holy Sites: A Call for Peace at a Time of Crisis” held in Jerusalem Jan. 9-13, 2015. On the foundation of decades of interfaith effort in the Middle East region, UPF offers a civil society peace initiative as a support mechanism to strengthen and stabilize the peace process being led by governments. 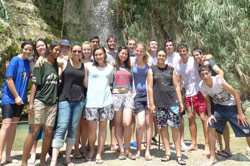 Daliat El Carmel, Israel - Sixteen youth from Europe and the Americas visited sacred and historic sites in Israel July 14-31, 2014, and spent several days in a Druze community doing service projects, teaching good sportsmanship and engaging in cross-cultural dialogue. A listing of programs of the Middle East Peace Initiative (MEPI) from 2003 to 2014. Jerusalem, Israel - A Middle East Peace Initiative program in Jerusalem brought together religious leaders, academics and NGO delegates with the theme of “Interfaith Dialogue and Cooperation for Peace and Development” beginning May 12, 2014. Participants in the interfaith consultation on “The Prospects for Dialogue and Reconciliation in Syria” in Amman, Jordan, Oct. 11-13, 2013, issued a joint statement. Amman, Jordan - A UPF gathering in Amman, Jordan, Oct. 11-13, 2013, assembled 40 participants to consider the theme: "The Prospects for Dialogue and Reconciliation in Syria: The Role of Religion in International Relations." London, UK - David Fraser-Harris, UPF-Middle East Secretary General, described some of UPF's activities in the region during a rare visit to London Oct. 1, 2013. Amman, Jordan - A program on "Intercultural Dialogue in Cooperation for Peace" in Amman on May 20, 2013, included a report about UPF's "Jerusalem Declaration" for interfaith cooperation.